The distinctive blue box. The engagement ring style. 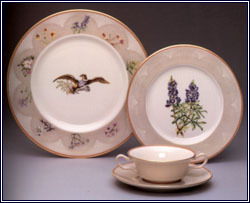 A China pattern fit for the White House. When you think of Tiffany’s, you think of diamonds and luxury that only a few can afford. But how did they get there? How did they leave their mark? By dedicating themselves to quality and excellence. 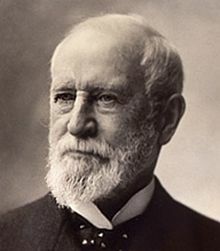 Charles Lewis Tiffany was born in Connecticut in 1812 and by age 15, was helping to manage a general store, one of his father’s many businesses. By 25, he was ready to strike out on his own, so with $1,000 borrowed from his father, he and his childhood friend, John B. Young, opened Tiffany & Young in New York City in the fall of 1837 as a stationery and fancy goods emporium, carrying writing materials and costume jewelry, among other things. They marked their goods with non-negotiable price tags – unheard of in those days, everyone haggled – and quickly gained a reputation for excellence. To set themselves apart, they chose a distinctive shade of blue for their boxes and bags to symbolize their dedication to quality and craftsmanship. Charles married John Young’s sister, Harriet, in 1839. Two years later, Tiffany & Young took on another partner, J.L. Ellis — who brought in much-needed expansion capital — and it became Tiffany, Young, & Ellis. 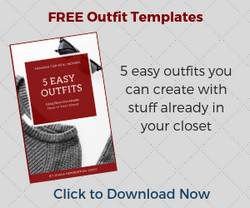 By 1845 they were successful enough to trade out the costume jewelry for fine jewelry, and they introduced their “Blue Book” catalog featuring their best pieces to entice customers into the store. It worked like a charm and has been an annual tradition ever since. They added silverware in 1847. Since the Victorian era European aesthetic of opulence and complicated patterns was all the rage, Tiffany,Young & Ellis did something completely different: they opted for simplicity, harmony, and clarity in their designs, with nature as their muse. It became their hallmark for holloware, flatware, glassware and jewelry. 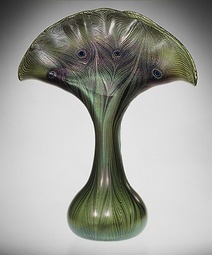 This streamlined “American Style” was quickly snapped up by the Astors, Vanderbilts, and Whitneys, and the like, who often commissioned custom pieces from the Tiffany Design Studio. But great design wasn’t their only forte. Charles Tiffany was also a great marketer. When John Young returned from a buying trip to Paris in 1848, he brought back a jeweled corset rumored to have belonged to Marie Antoinette. Anxious to exploit this, Tiffany teamed with P.T. Barnum to spread the word. The store was packed for months. They opened their second location in Paris in 1850. In 1853, Charles Tiffany bought out both his partners and changed the name of the firm to Tiffany & Co. 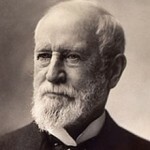 He continued to build his reputation with high-profile commissions, including a seed pearl necklace for President Lincoln, who gave it to his wife, Mary. During the Civil War, Tiffany supplied the Union Army with swords and surgical equipment. At the Paris Exposition Universelle of 1867, Tiffany & Co. became the first American firm to win an award for silverware excellence – a landmark win that garnered so many European commissions, they opened a third location in London in 1868. By 1870, Tiffany & Co. had become America’s premiere purveyor of jewels and timepieces as well as luxury table, personal, and household accessories. They introduced their Japanese bird-inspired “Audubon” flatware in 1871, which is still the company’s best-selling pattern. 1878 brought even more accolades at the Paris Exposition – a gold metal for jewelry, a grand prize for silverware – as well as a monumental purchase: a huge, rare, nearly-perfect canary diamond from the Kimberley diamond mine in South Africa: 287.42 carats. Tiffany became the first jeweler to hire a gemologist when he brought George Frederick Kunz on board to cut the diamond to 128.54 carats with 90 facets. 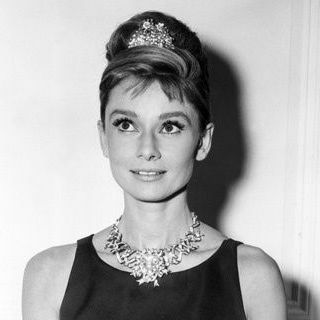 The diamond is still at the New York store and has only been worn twice: by Mary Whitehouse for the 1957 Tiffany Ball in Newport, Rhode Island, and by Audrey Hepburn for publicity photos for Breakfast at Tiffany’s (1961). 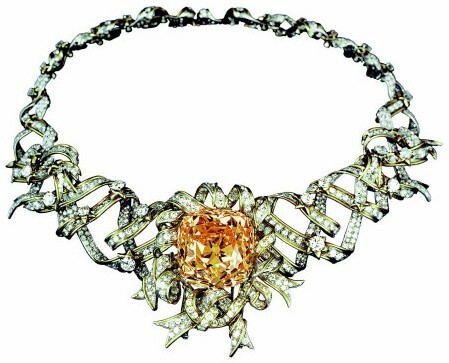 It was attached to the Jean Schlumberger-designed Ribbon Necklace for the photo stills. In 1886, to the delight of brides-to-be everywhere, Tiffany & Co. introduced their “Tiffany Setting” engagement ring. 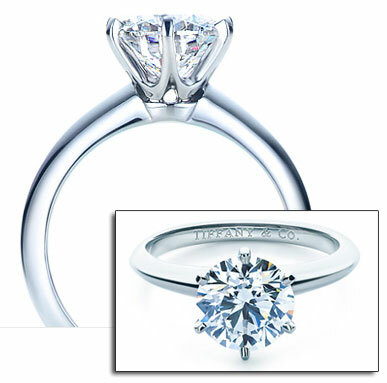 The six-prong setting showcases a solitaire by raising it up off the band and allowing the light to shine through. After scoring some of the French crown jewels at auction in 1887, Charles Lewis Tiffany was crowned “The Kind of Diamonds” by the press. Tiffany & Co. continued to open stores and win awards at every turn, and by 1900, it led to their appointment as Imperial Jeweler and Royal Jeweler to the crowned heads of Europe, Russia, and the Ottoman Empire. 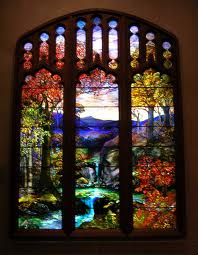 Meanwhile, Charles’ oldest son, Louis Comfort Tiffany, (born 1848) was making a name for himself in glassmaking and interior design. After doing the interiors for Mark Twain’s house in Connecticut in 1881, Louis was commissioned by President Chester Arthur to redo the White House state rooms in 1882. 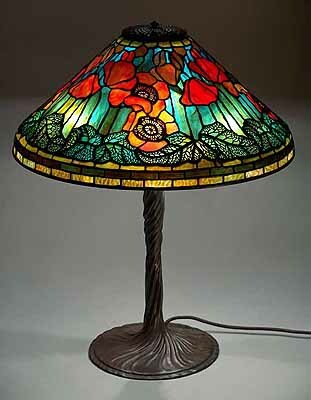 He did a great job, but Louis preferred glasswork to interior design, so he dismantled his interior design company in 1885 and started a glassmaking company instead, focusing on lamps and stained glass windows. He became one of the most popular Art Nouveau artists. At its peak, his company employed 300 artisans making handmade glasswork. When Charles Tiffany died in 1902 at the age of 90, Louis was named artistic director of Tiffany & Co. He established the “Tiffany Art Jewelry” department to create and manufacture his innovative jewelry and enamels. A whole floor of the New York store carried Louis Tiffany-designed items. Tiffany & Co. continued to garner accolades and commissions throughout the 20th century. From the America’s Cup to the Superbowl Trophy, Eleanor Roosevelt’s engagement ring to Lady Bird Johnson’s White House China, the Great Seal to the Congressional Medal of Honor, Tiffany’s has done them all — while also setting high standards. Their 925/1000 sterling standard was adopted by the United States in 1851. Their chief gemologist, George Kuntz, pushed for the international adoption of the metric carat as a weight standard for gems in 1907. Then, in 1926, Tiffany’s standard for purity becomes the official standard of platinum in the United States. Want to know why Tiffany’s is praised in movies, songs, and books? Excellence. When you do something really, really well, people notice. People have been noticing Tiffany’s for nearly two centuries. You can look, learn, and drool at Tiffany.com .